For many pet owners, our furry friend is a part of the family. What would you do if your beloved pet were to wander off and unable to find their way home? Many of us would search high and low, post flyers, drive aimlessly around the neighborhood and check at local rescue shelters. Those days are now over as technology allows us to immediately locate our pet via our mobile phone. 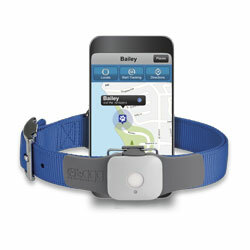 The new technology connecting pet parents and their pets is Tagg GPS Pet Tracker. Tagg is a small collar attachment that uses GPS technology to alert you on your smartphone whenever your pet escapes outside the perimeter of your home. Unlike the traditional microchip that confirms the identify of your pet once they've been taken to a shelter, Tagg sends alerts for you and up to five people through text messaging and email. Tagg offers a free mobile app for iPhone and Android to make connecting with your pet even easier. Another benefit of Tagg GPS Pet Tracker is the Activity Tracking feature, which monitors your pet's activity levels daily using a built-in accelerometer. You can use a point system based on your pet's breed, height and weight to set daily activity goals. Monitor the points to see if your pet is getting the 30-60 minutes of daily vet recommended exercise or to bring up any unusual activity to your vet. Tagg GPS Pet Tracker is a small collar attachment that uses GPS technology to alert you on your smartphone whenever your pet escapes outside the perimeter of your home. Just ask Robert and Claire Krzyzanowski who credit Tagg for saving the life of their German Shepherd puppy Rommel. It was the start of a relaxing weekend on a cold Saturday morning in Michigan when both Robert and Claire had received alerts on their cell phones that the pups were out of the Tagg Zone. To their horror, the Krzyzanowskis discovered the that both of their German Shepard puppies had made their way to the middle of a frozen pond on the Kryzanowski's property, and Rommel had fallen through the ice. When the Krzyzanowskis arrived, Rommel was struggling for his life in the frozen water. Robert was immediately to the rescue. "I ran out onto the ice, eventually crawling on my hands and knees and then lowering flat when the ice got thin," said Robert, recalling that day. "All I was thinking at that moment was, 'I have to get a line on him before he slips under the ice and drowns.' Every second counted." Robert successfully tied a string of leashes around Rommel's collar and expertly leveraged them to quickly and safely pull Rommel out of the water and to safety. From there, Claire and Robert went to work treating Rommel for hypothermia, raising his body temperature to normal. After an hour, the shaking Rommel had stabilized, his worried brother Patton by his side the whole time. After saving Rommel from the frozen pond, Robert and Claire realized they would have never known if not for their Tagg GPS pet tracker. To learn more about Tagg, visit www.pettracker.com. Submitted by Tagg for the Entrepreneurs' Organization.